No matter the season, there’s no better time to get your home’s exterior cleaned up with a good professional pressure washing. Professional commercial pressure washing equipment is much stronger than the equipment you can rent at a home improvement store. Our pressure washing machines are also able to be used on more delicate surfaces with the right settings and techniques. Whether it’s older materials or newer on the exterior of your Woodstock home, we can make them look clean and beautiful again. If you could just see how great your home would look if it was all sparkling clean on the outside, you’d be astounded to realize how dirty it’s really become. We get so used to looking at our home every day that it’s easy to see how over time we just don’t notice the old stains, discoloration, or the graying of the siding, driveways, or concrete. Getting your home’s exterior pressure washed is going to make it stand out once again. There’s no better way to clean up your home after a season of weather here in the Woodstock area. 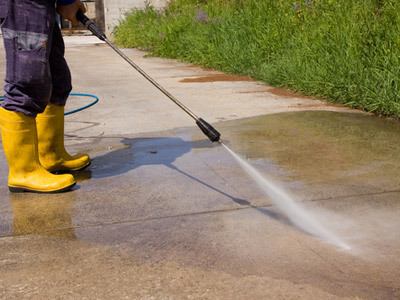 We can pressure wash your siding, sidewalks, driveways, garage floors, decks, and more. We know how to properly pressure wash all your home’s exterior surfaces, especially any delicate areas that could be damaged. As professional contractors, we’ll provide you with affordable rates to clean up your exterior with pressure washing services in the Woodstock area. It’s important that your home gets all the polluted dirty grime cleaned off from time to time, and it’s extremely important to have the siding cleaned prior to any paint work. Decks can also be pressure washed and restored to almost like-new finishes. You’ll always get a free estimate for you pressure washing services. Whether you are trying to restore your deck or you need to get your home’s exterior cleaned up for the season, our professional pressure washing team is ready to help. You’ll find reasonable rates that are value based for our affordable services. Yet you’ll always get the highest quality workmanship from our experienced professionals. Our pressure washing team knows how to use our commercial power washing equipment and what the best techniques are to clean all types of surfaces no matter how delicate. We take good care of your old dirty siding, windows, stucco, or old historical home surfaces that might get damaged under normal high powered pressure washing conditions. We have safe soft-wash pressure washing techniques that won’t hurt your home. Call our Woodstock Painters today for pressure washing done right. After it’s clean you may just want us to stick around for a paint job! If you are looking for pressure washing or power washing services in the Woodstock, GA area then please call One Man and A Brush at 678-368-5115 or complete our online request form.